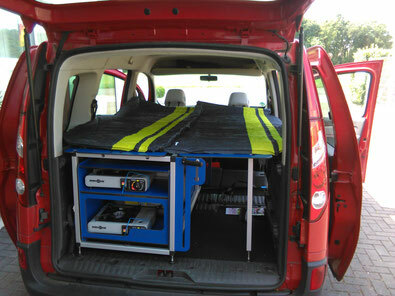 Renault Kangoo - mokea42s Webseite! 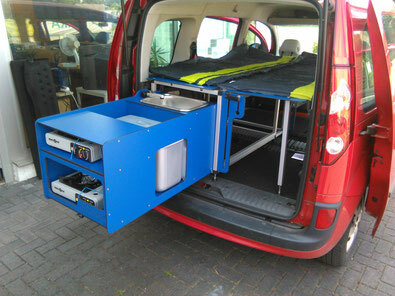 Here you see a latest Kangoo. 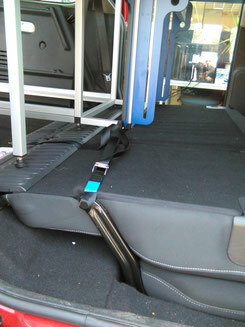 The rear passenger seats can be folded nearly even without any disassembling. - unfortnatly you do not get an even surface when the back seats are folded to the front. It is not good to have spotty loads on this part of the car boot surface. -there is no 12V-plug in the rear of this model. You have to use the additional battery box. What has to be disassembled? Just the car boot cover. Because of the uneven surface, the front adjustable feet have to be dismantled. The adjustable feet behind have to be screwed completly without the counter nuts and the feet in the back are adjusted so that the lying surface is horizontal. The unit is fixed with two straps to the left points. 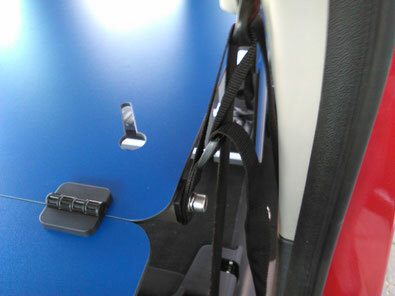 Because of the special back seat design there are no free bolts for the third fixing point. Here the third strap is lead through a hinge of the back rest.. The front passenger seats can be easily folded. The securing belts for supporting the unfolded lying surfaces can be guided through the upper safety belt fixing points. You will need just two poles for the right lying surface. 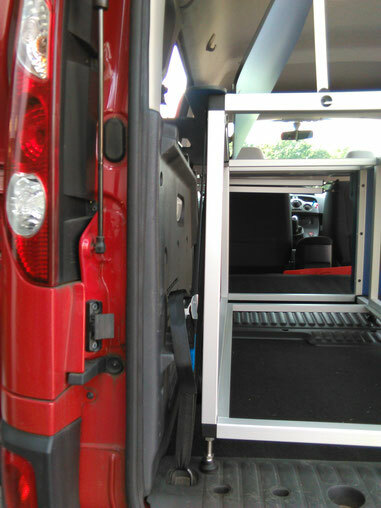 The lying surface is arranged above the rear wheel box covers. The strap is lead through the seat belt positioner. You need two poles on the right side. And with extracted kitchen box. What else fits beside the unit? 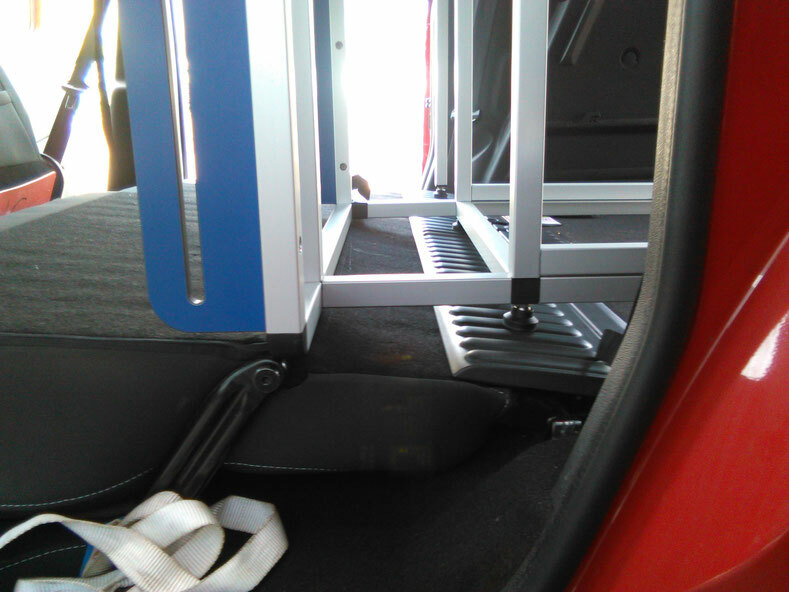 The back rest of the right passenger seat can be folded quite similar to a VW Caddy. 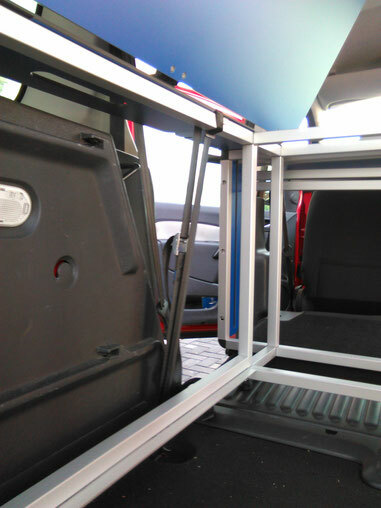 So you will get similar space for your gear as in the Caddy. Nevertheless the volume of the back seats is still in the car as consequence of the special mechanical design.